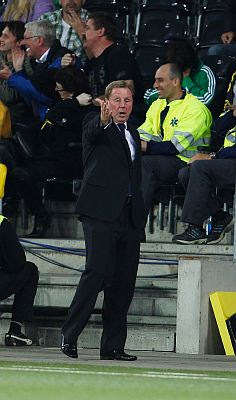 Boy what a difference twenty-four hours makes in Harry Redknapp's world. In Monday's Champions League press conference: "But let's be honest, we should beat them, shouldn't we? I'm sure we're ready to play and the Astroturf shouldn't be a problem because technically, we've got players like [Luka] Modric. You can see him and all these people playing on Astroturf. You could see Modric playing on anything, couldn't you?" After Tuesday's 3-2 defeat at the hands of Young Boys of Bern: "We didn't like it yesterday and tonight the players were pulling faces and suggesting that they didn't like the look of it." "I don't agree with Astroturf and I don't think Astroturf should be used in a competition like this." Sure, I could just stop this piece now and we could all share in a good laugh, but I just can't do it. What's sad is: instead of Harry praising his side's fight to come from 3-0 down and completely out of this tie, to having a very good chance at home, he has to spew forth his ready made bag of excuses. What's even sadder is, every one of us should have seen this coming from a mile away. The hubris spewed from the English press, and the Tottenham manager forgot one simple thing...they weren't playing a joke. The line up in and of itself was shocking. To blame the surface for producing the starting eleven he did was pathetic. The only one who should have not been in the starting eleven, and only because it's the status quo with his bad knees, is Ledley King. This wasn't some random Premier League game against a side you were going to pick three points up in, this is a shot at making your club quite a bit of coin. To simply leave four of your normal starters out to protect them for things to come is just head scratching. Instead, your starting lineup produced three major defensive errors in the opening half an hour of play, forcing Harry to play one of his 'protected few' in Tom Huddlestone for the better part of an hour. Both goals were fortunate, as Bassong's opener found the one inch of space between the man on the post and goal post itself to sneak through. While the second goal was a brilliant strike from Pavlyuchenko, he had done nothing the prior eighty-two minutes he was on the park except try to get himself nominated for a Razzy. Frankly, had Jermain Defoe not injured himself, he would have been the striker replaced as Tottenham looked for an equalizer. While Tottenham still have a decent chance of advancing to the knockout stage, it's not as cut and dry as many people think. Young Boys have already traveled to a more hostile ground than White Hart Lane and picked up a result. That's all they have to do next Wednesday. Instead of talking about how poised this tie is heading into the second leg, we're talking about the excuses Harry Redknapp made in defeat. Unfortunately, that's probably just the way he wanted it.